FLOW-3D‘s phase change model simulates vaporization and condensation at a liquid/gas interface. It predicts the formation and interactions of vapor bubbles throughout a surrounding liquid — the bubbles can nucleate, respond dynamically to liquid motion, and can grow or shrink depending on the temperature and pressure of their surroundings. FLOW-3D‘s existing phase change model is a powerful tool that predicts the formation and interactions of vapor bubbles and the surrounding liquid – the bubbles can respond dynamically to liquid motion, and can grow or shrink depending on the temperature and pressure of their surroundings. However, it has not yet been possible to include the effects of a non-condensable gas that may be present along with the vapor inside the bubble or other vapor space. This can be important, for instance, in the dynamics of an air/water/steam system, where bubbles containing both water vapor and air can exist at conditions cooler or at lower pressure than would the vapor alone. FLOW-3D removes this limitation by allowing users to model non-condensable gases. Plot of pressure within the cryogenic tank: comparison between test data (red) and FLOW-3D model (blue). The pressure rises due to gradual heating through the tank walls and then rapidly decreases due to introduction of a cool nitrogen spray. In this example of a tank containing a cryogenic liquid/gas combination and a second non-condensable gas component, the walls of the tank are gradually heated until a specified tank pressure is reached, at which point a spray of cool liquid is introduced to rapidly decrease the temperature and thus depressurize the tank. This process is cyclic. Work based on this model was presented at the American Institute of Aeronautics and Astronautics conference. 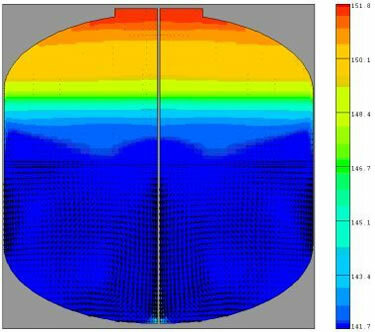 This work included a comparison between actual test data and computational simulations of cryogenic tanks containing liquefied gases in combination with a second, non-condensable gas (typically helium). The plot on the left shows the pressure within the vapor region of a tank containing liquid nitrogen with a gas space containing nitrogen vapor and helium gas, as a function of time. In the example, the walls of the tank are gradually heated until the tank pressure reaches 25 psi, at which point a spray of cool liquid nitrogen is introduced to rapidly cool (and thus depressurize) the tank. This process is then repeated. The simulation data shows good agreement with actual test data; the errors are typically of the order of ~10%. Errors between the FLOW-3D model and the test data can be partly attributed to the fact that the rate of heat transfer in the model is assumed to be constant, as the heat transfer coefficient is difficult to measure, and the liquid spray injected into the tanks is held at a constant temperature.